At NewsHunt we have been lucky enough to have continued love of our users. Most of our app releases include a heavy mix of user suggested features and as a result we see a quick uptake on version updates with most users upgrading to new version within a few days. We recently made a release on Android where we noticed a dramatic drop in new version upgrade rates. 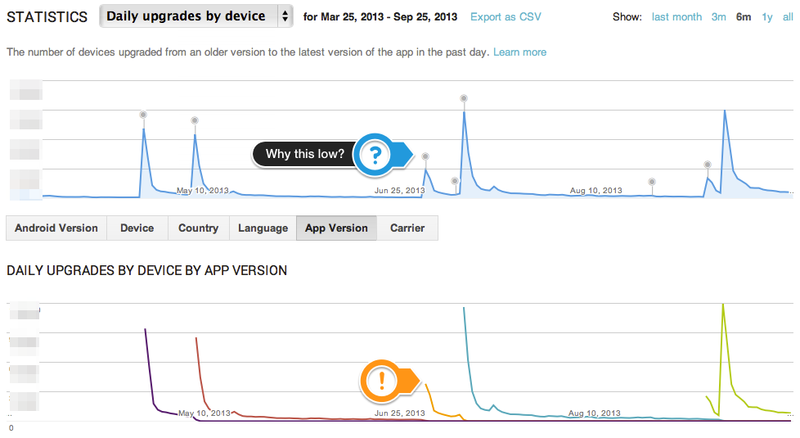 If you are not familiar with Google Play’s Developer console – the above two graphs show “Daily Upgrades By Device”, and “Daily Upgrades by Device By App Version”. All the nice spikes that you see are when we have released a new build, all except one for July 2nd where we saw a relative adoption rate of only 30%. Quick investigation led to a new feature that we had added to support MRAID. One of the possible ad types that MRAID supports is ability to show ads that lets you save an event detail(imagine an ad for a concert) to your device calendar. To enable access to device calendar, Android wants you to specify the same as part of application property/permissions. To be honest, and credit where due – our QA did notice this. But we were all so used to clicking the ACCEPT button, especially for our own app, any concerns were quickly brushed aside saying “no one reads this”. Well apparently they do, and they do not like it. Few loyal users noticed it too – and asked rather nicely to what was going on. We quickly realized our mistake, removed that calendar event ad feature, and released a new build. Within few days it was business as usual. a) An average user – even in India (where people give their mobile numbers to everyone) cares deeply about their privacy. 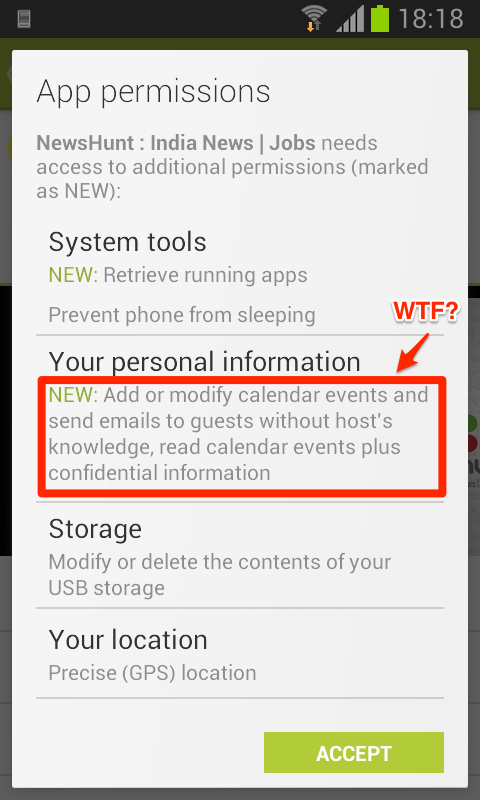 b) People do read the App Permissions screen, so be careful what you ask for. Nice one ….. all these learnings will help building quality apps …..